Saturday’s 9th race (4:10pm ET) from Keeneland is the Grade 1 Breeders’ Cup Juvenile for 2-year-olds traveling a mile and a sixteenth on the main track. #3 GREENPOINTCRUSADER (4-1) owns an ascending numbers pattern and looked great in the G1 Champagne. He’s bred to be a good one and should continue to develop. #7 Brody’s Cause (7-2) is 2-for-2 on dirt and packed a strong late punch in the G1 Breeders’ Futurity here Oct 3. #9 Exaggerator (6-1) had the lead in the lane off a layoff but could not hold off Brody’s Cause in the aforementioned Breeders’ Futurity. He could be fitter this time. #1 Conquest Big E (30-1) was 2nd to Brody’s Cause in his bow and looked good visually in his course/distance maiden win Oct 2. He’s training well and has a bright future. We shall see if he is ready for prime time. #13 Nyquist (9-2) is 4-for-4 but his numbers dropped in his last two at 7f and a mile and a sixteenth. #12 Swipe (15-1) lost to Nyquist in his last three but is closing the gap as distances increase. 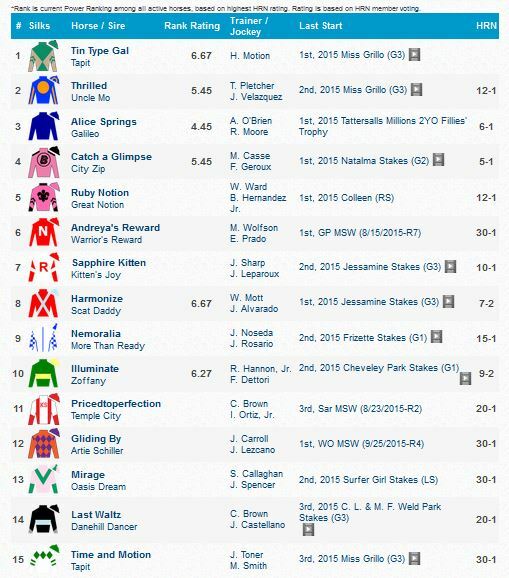 ***Saturday’s Breeders’ Cup full card anaylsis from Keeneland includes Pick 5, Pick 4, and Pick 6 tickets. 2015 Full Card ScheduleI am offering the following full cards for $10/each at therunawayhorse.com:BREEDERS’ CUP Saturday from KEENELAND (Oct 31, $15).DEL MAR full card weekends (Nov 1, Nov 7-8, Nov 14-15, Nov 21-22, Nov 28-29). BREEDERS’ CUP Saturday from KEENELAND (Oct 31, $15). DEL MAR full card weekends (Nov 1, Nov 7-8, Nov 14-15, Nov 21-22, Nov 28-29). 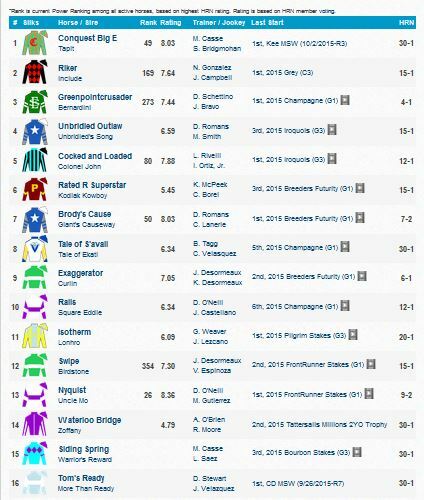 Friday’s 8th race (4:50pm ET) from Keeneland is the Grade 1 Breeders’ Cup Juvenile Fillies Turf for 2-year-old fillies traveling one mile on the turf course. #3 ALICE SPRINGS (6-1) was only 1.25 lengths behind Illuminate at 6f Sept 26 and came back to cruise vs. eleven foes at seven furlongs a week later (both under Ryan Moore). She drew well, is bred to go this far, and is on the improve for O’Brien. #14 Last Waltz (20-1) is now trained by Chad Brown and her Racing Post Rating advanced in all four outings (102-98-83-74). #9 Nemoralia (15-1) was 2nd in the G1 Frizette (sloppy track) and beat 18 foes in an overseas turf sprint Sept 10 (94 Racing Post Rating). I always respect Noseda when he enters a horse in the U.S.
#4 Catch a Glimpse (5-1) exits back-to-back Woodbine turf wire jobs and the 2-3 finishers from the G2 Natalma both came back to score. #8 Harmonize (7-2) is versatile, training well, and a nose away from being undefeated. #10 Illuminate (9-2) brings strong overseas turf sprint form to the table for Hannon and her Racing Post Ratings are strong (112-107-107-85). Upcoming full cards: DEL MAR full card weekends begin Sunday, November 1. *** Every full card includes suggested Pick 5, Early Pick 4, Pick 6, and Late Pick 4 spread tickets. The next and biggest Kentucky Derby 2016 points race for freshmen is the Grade 1 Breeders’ Cup Juvenile on Saturday, October 31. 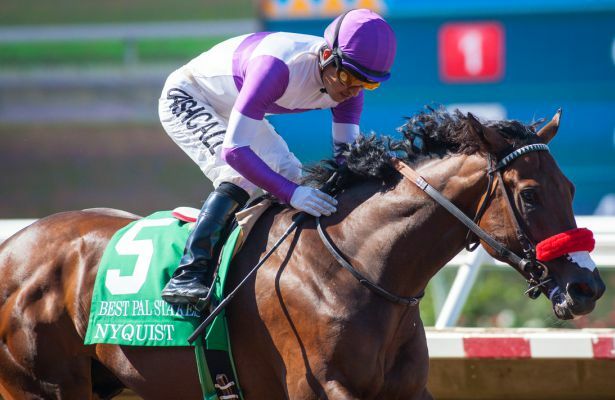 There were nineteen horses pre-entered earlier this week including G1 Frontrunner winner and possible favorite Nyquist, G1 Champagne hero Greenpointcrusader, and G1 Breeders’ Futurity winner Brody’s Cause. Nyquist is a perfect 4-for-4 but his margin of victory and speed figure dropped over a route of ground in the FrontRunner. The early/pressing type obviously has talent but could be vulnerable shipping across country and facing better competition. Greenpointcrusader looked great in the Champagne (one turn mile) on wet ground. He still must prove himself around two turns but he is bred to adore the added real estate. Since the Breeders’ Cup is at Keeneland this year, Brody’s Cause might have the edge with a good looking stakes win over the track. He needs pace help. Breeders’ Futurity runner up Exaggerator should be in a nice position stalking the pace and will get a jump on the late runners. He can move up in his second start off a layoff for Keith Desormeaux, who saddled last year’s BC Juvenile winner Texas Red. Conquest Big E is an interesting contender at a price for Mark Casse. He was beaten a length by Brody’s Cause in his bow and returned to break his maiden in visually impressive fashion at Keeneland. He might lack the experience to win a race like the BC Juvenile but clearly has a ton of raw ability and is an excellent long-range Derby prospect. 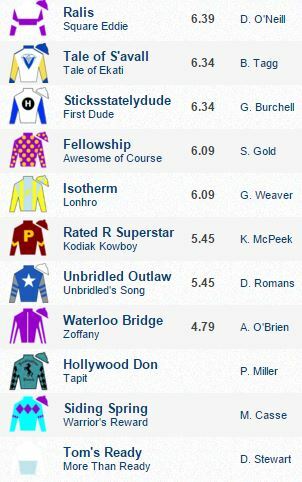 G3 Iroquois (10-12-15, 81 BSF): Cocked and Loaded stalked, pounced, and kicked clear to win by 2-lengths over Rated R Superstar, Unbridled Outlaw, and Conquest Windycity. The Iroquois has not been a productive race in regards to Derby contenders in recent years. G1 FrontRunner (10-26-15, 79 BSF): American Pharoah won the FrontRunner last year. This time around, Nyquist was the overwhelming favorite and he remained undefeated with yet another win over Swipe. His margin of victory dipped and talented juvenile filly Songbird ran much faster in the G1 Chandelier. Nyquist looks like a miler and did not make my initial Derby list on 9-30-15. G1 Champagne (10-3-15, 94 BSF): The track was sloppy (sealed). Greenpointcrusader, #10 on my first Derby rankings list, rallied from 6th to post an easy 4.5 length win under Joe Bravo. Longshot Sunny Ridge stalked, pounced, took the lead, and finished a couple lengths clear of Portfolio Manager. Two other Champagne runners were on the Derby list, Sail Ahoy and Ralis. The former ended up an even 4th and should improve around two turns next year for patient trainer Shug McGaughey. The latter pressed and faded as the beaten favorite in a puzzling performance. G1 Breeders’ Futurity (10-3-15, 88 BSF): This important local prep for the BC Juvenile might have a major impact on the big race Oct 31. Brody’s Cause went 10th to first in a visually impressive one-length win over post time favorite Exaggerator. Rated R Superstar was 3rd and Sicksstatelydude rounded out the top four. G3 Grey (10-4-15, 84 BSF): Riker entered the race undefeated and kept his perfect record intact with a comfortable wire job win over four rivals. He is a proven all-weather performer at Woodbine and will try to take his show on the road in the BC Juvenile. Latest Workouts: 5f bullet in :59.81 (1/12) at Belmont Park on Oct 14. A 4f breeze in :49.98 (15/22) at Belmont Park on Oct 21. Comments: The $2.2 million yearling purchase was a determined 1/2 length winner (87 BSF) at six furlongs in his Belmont Park debut on 9-19-15. Dam Justwhistledixie won the G2 Davona Dale and G2 Bonnie Miss at GP in 2009. The G2 Nashua on Nov 4 at Aqueduct is next. He retains the top spot on my list. Comments: $650k purchase had a slow start, made a nice inside middle move, took the lead, and ended up a clear 2nd (83 BSF) in his 6f Santa Anita debut Sept 27. He returned at a flat mile Oct 23 and cantered to an easy win as the 1-2 favorite (geared down under Gary Stevens). He moves up one spot. Latest Workout: 5f in 1:01.80 (9/17) at Keeneland on Oct 19. Comments: Put it all together from off the pace in a strong 4-1/2 length victory in the Champagne. I really like his pedigree and he figures to get better with age. He’s pre-entered in the BC Juvenile. He was #10 on my first list. Latest Workout: 5f breeze in 1:01.80 (18/59) at Churchill Downs Oct 17. Comments: Looked great from off the pace in back-to-back wins at Churchill (one mile maiden win) and Keeneland (G1 Breeders’ Futurity). He’s pre-entered in the BC Juvenile and looks like a solid contender from the back of the pack. He was #11 on my first list at the end of September. Latest Workouts: 5f in 1:00 (2/40) at Churchill Downs Oct 16. Breezed 4f in :48.40 (9/49) at Churchill Downs Oct 23 (geared down). 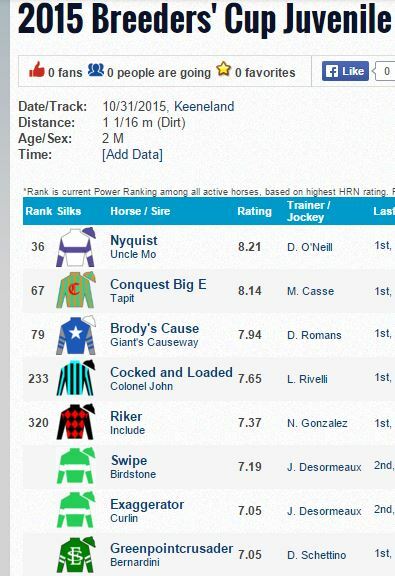 Comments: Visually impressive maiden win at Keeneland Oct 2. He is still learning and appears to have a bright future. He’s pre-entered in the BC Juvenile. He moves up from #7. Latest Workout: 4f breeze in :49.32 (12/36) at Belmont Park on Oct 19. Comments: He did not run a complete race from start to finish and ended up an even 4th in the Champagne. He figures to improve around two turns and should get better next year for patient trainer Shug McGaughey, who saddled Kentucky Derby winner Orb in 2012. He stays put at #6. Comments: Could not match strides with Toews On Ice in the Speakeasy (six furlongs) at Santa Anita Oct 18 but was clearly second best. He seems to want more ground and remains a promising sort. He drops two spots. Latest Workouts: 5f bullet in :59.16 (1/14) at Keeneland on Oct 16. Breezed 5f in 1:00.80 (5/17) at Keeneland on Oct 23. Comments: G1 Hopeful winner stalked and weakened in a disappointing effort in the Champagne (wet track). He might prefer fast ground and is almost certainly better than his last. He’s pre-entered in the BC Juvenile. He drops four spots to #8. Latest Workout: 5f bullet in 1:00.80 (1/8) at Belmont Park (dirt training) on Oct 9. Comments: $900k purchase battled with Mohaymen throughout and ended up 2nd in his debut. No published works since Oct 9 (it is Oct 23 now). He drops seven spots. Latest Workout: 5f in 1:02.20 (24/28) at Santa Anita Park Oct 13. Comments: Went all the way in an easy wire job debut at Del Mar Sept 5 (86 BSF). He is fast and has a sprint-oriented pedigree. No published works since Oct 13 (it is Oct 23 now). He’s down one spot. Latest Workout: 5f in :59.40 (2/42) at Santa Anita Oct 8. Comments: Romped in his Los Alamitos debut Sept 11. No published works since Oct 8 (it is Oct 23 now). He drops three spots. It seems impossible but it is that time again, and the September tradition continues. This is my first in a series of blogs devoted to Kentucky Derby 2016 contenders. This is just the beginning and there will be many twists and turns in the weeks and months ahead. 10 of the last 15 Kentucky Derby winners graduated by October 4, including 7 of the last 9. Kentucky Derby 2012 hero I’ll Have Another captured his career debut at Hollywood Park on July 3 of his juvenile season. Kentucky Derby 2013 winner Orb lost his first three juvenile outings. He graduated at the Big A on November 24, 2012, his first of five straight wins, culminating in a scintillating off the pace tally under the Twin Spires on May 4. Kentucky Derby 2014 winner California Chrome earned his diploma in his second career start ($100k Graduation – 5.5f) at Del Mar on July 31, 2013. He ended his juvenile season with an easy win in the King Glorious, the beginning of a 6-race winning streak that ended with a dead-heat for 4th in the Belmont Stakes. Triple Crown 2015 winner American Pharaoh graduated in the G1 Del Mar Futurity on 9-3-14, the beginning of an 8-race win streak (7 Grade 1‘s and a Grade 2). Some of my original September Derby blog juvenile contenders panned out, like my early 2010-2011 Number 1’s Stay Thirsty and Alpha. Both won the G1 Travers during their 3-year-old seasons. Others turn out to be disappointments, such as Fortify and Purple Sky, my 2012 and 2013 original Number 1’s. International Star was my original number one Kentucky Derby 2015 contender and he was scratched the morning of the Derby. 3 of my original 11 Derby contenders made it to the starting gate including winner American Pharoah. The other two were Frosted and Carpe Diem. An ideal Kentucky Derby contender would have a solid juvenile foundation, a long-winded pedigree, sharp graded stakes form, running style versatility, and winning connections. Strong pre-Derby works are the icing on the cake. G1 FrontRunner (79 BSF): American Pharoah won the FrontRunner last year. This time around, Nyquist was the overwhelming favorite and he remained undefeated with yet another win over Swipe. His margin of victory dipped and talented juvenile filly Songbird ran much faster in the G1 Chandelier. Nyquist looks like a miler and will not make my Derby list at this time. G3 Iroquois (81 BSF): Cocked and Loaded stalked, pounced, and kicked clear to win by 2-lengths over Rated R Superstar, Unbridled Outlaw, and Conquest Windycity. The Iroquois has not been a productive race in regards to Derby contenders in recent years. There are three Derby points races this weekend: G1 Champagne (Belmont Park, Oct 3), G1 Breeders’ Futurity (Keeneland, Oct 3), and G3 Grey (Woodbine, Oct 4). Comments: The $2.2 million yearling purchase was a determined 1/2 length winner (87 BSF) at six furlongs in his Belmont Park debut on 9-19-15. Dam Justwhistledixie won the G2 Davona Dale and G2 Bonnie Miss at GP in 2009. The G2 Nashua on Nov 4 at Aqueduct might be next. Comments: $900k purchase battled with Mohaymen throughout and ended up 2nd in his debut. He is one of three Bernardini freshman to make the initial list. Comments: $650k purchase had a slow start, made a nice inside middle move, took the lead, and ended up a clear 2nd (83 BSF) in his 6f Santa Anita debut Sept 27. He will not be a maiden much longer. Latest Workout: 5f in 1:01.60 (53/87) at Santa Anita on Sept 26. Comments: His five starts include a second time out maiden win at Santa Anita, a 2nd in the Graduation Stakes at Del Mar, and a romping win in the G1 Hopeful (93 BSF) at Saratoga Sept 7. He is entered in the G1 Champagne at Belmont Park on Saturday, Oct 3. Comments: Followed up a distant 4th behind a runaway winner in his Del Mar bow with a professional stalk/pounce win under Bejarano at Santa Anita Sept 27 (87 BSF). Latest Workout: Breezed 4f in :47.66 (5/40) at Belmont Park on Sept 27. Comments: Rallied to finished a distant 3rd (17-1 odds) behind Ready Dancer & Condominium in his six furlong debut at Saratoga Aug 29. He was ready to roll in his second start at Belmont Park (one mile, Sept 12), going last-to-first by a head at 3.95-1 odds. He is entered in the G1 Champagne at Belmont Park on Saturday, Oct 3. Latest Workout: 4f in :47.20 (2/32) at Churchill Downs Sept 25. Comments: Broke in the air, rallied wide to take the lead, and was run down by Brody’s Cause in his flat mile debut at Churchill Sept 11. His is still immature and needs to get over his gate issues. Latest Workout: 5f in 1:00.60 (4/13) at Los Alamitos Sept 25. Comments: Romped in his Los Alamitos debut Sept 11. Latest Workout: 5f bullet in :59.20 (1/55) at Santa Anita Park Sept 28. Comments: Went all the way in an easy wire job debut at Del Mar Sept 5 (86 BSF). Latest Workout: 5f in 1:00.85 (5/31) at Belmont Park Sept 26. Comments: Missed by a neck in his Saratoga debut July 25 and scored by a neck at that same venue (seven furlongs) second time out Sept 5. He is entered in the G1 Champagne at Belmont Park on Saturday, Oct 3. Latest Workout: 5f breeze in 1:01.80 (21/43) at Churchill Downs Sept 26. Comments: Finished 8th in his Ellis Park debut and went last-to-first (paid $69.20) to beat well-meant first timer Conquest Big E at a flat mile (Churchill Downs) Sept 11. He is entered in the G1 Breeders’ Futurity Stakes at Keeneland on Saturday, Oct 3.